This hike begins at the Mountain Lake boat launch. Travel north, clockwise around the lake. A level trail makes for a nice and easy warm-up before the short climb up to Twin Lakes. At the northern end, after hiking down a moderate incline and crossing a small wood bridge you will see the sign directing you left up the hill to Twin Lakes. This shady, sometimes gloomy part of the park is a mushroom hunter’s paradise. During the season a wide variety of fungi festoon the edge of the trail, the logs and the trees. 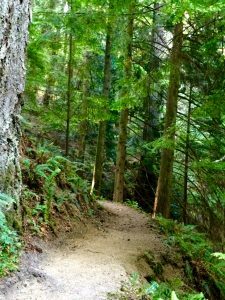 The trail follows a small stream lined with tall cedar trees until, about half way up the hill, the cedars give way to alders. Tall marsh grass hide the pools and ponds hosting the source of that skunk-like odor, the marginally edible skunk-cabbage. Exiting this microenvironment the trail will become a little more steep as you pass through a forest of fir, cedar and hemlock before reaching “the twins” and the intersection of several trails. At this intersection you have several options. Left takes you up an aerobic 1289 foot climb to the top of Mount Constitution. Right takes you to the intersection of the twins and the trail around Mount Pickett, a not so aerobic climb of 740 feet. Or you can end the uphill climb and travel a figure-eight around the lakes. Or you could go jump in a lake…at the right time of year! Do the figure-eight by turning right. Cross the small bridge and continue a short distance to reach the turn-off to Mount Pickett. Traverse the small gully. The original trail around the big twin is visible on the left as is the lake. If you follow this trail you’ll quickly find yourself facing a hole the size of a small foreign car. Look carefully to see a small, barely visible trace climbing up the knoll almost directly ahead. This detour becomes a little hard to follow just before it meets up with the main trail. At this point the trail becomes more difficult to follow. It climbs a steep set of “stairs” and travels along the mossy face of the rocky outcrop before hitting the first of several seasonal water obstacles. Run-off streams pose a small challenge unless you hike the trail after a serious rain. Around the back side of the big twin you may notice tall white stakes marking the boundary of the park. The trail actually exits the park and travels through a day camp for Camp Orkila at this point. You’ll enter familiar territory when you complete your journey around the big twin. The cross trail to the top of the mountain will be on your right. You may be tempted to skip the little twin and head back down the hill. If you hike after days of rain it might be a good idea to head back to the lake. The trail around the small twin can get a bit swampy. Cross the wood bridge again. This time veer right after the up and down of the gully and follow the trail clockwise around the little twin. The beginning of this trail is gorgeous with a peaceful view of the lake and a nice big log inviting you for a short sit-down. Deceiver! The little twin is the evil twin! Just so you know. About a third of the way around little twin you hit the first of several bridges which appear to be older than light. Uneven, slippery and with gapping holes they invite a twisted ankle or short step into chilly water. Then you hit the squishy part of the trail. Twin Lakes reside in a marshy saddle between Mount Constitution and Mount Pickett. I made this hike after a period of heavy rain and quickly wished I brought my scuba gear because the trail was under water. A little “off-roading”, a deer skeleton or two and a balancing act along a log or three takes us the final distance around the little twin to the gully and cross-trail. Turn left for a third trip over the wooden bridge and left again to head down the hill to Mountain Lake. When you reach the lake check your time. If you have an hour turn left to hike the east side of the lake. You’ll have a teeny, tiny 250 foot elevation gain up a series of switchbacks before you reach the “message board”. There you can check the most recent post and make a new one. A right turn when you reach Mountain Lake will take you back to the boat launch. Either way the trail will become level near the end so that you’ll have a nice “cool down” walk as you head back to your car. Now that we are back safe and sound would someone please adopt this poor relation, the Twin Lakes loop, and give it some luv! 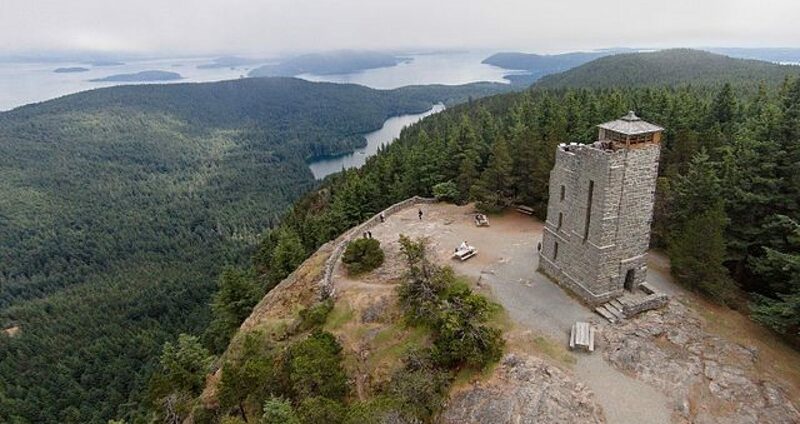 Whether you are a hardy hiker or a Sunday stroller, Orcas Island has a hike for you. All hikes feature a lush, green forest with moss covered logs or rocks inviting you for a sit-down amid quiet serenity. Many offer phenomenal sweeping views of the islands or roaring waterfalls or reflective lakes. The Mountain Lake loop is what I like to call a “no-brainer” hike in that the trail is wide, well-marked and doesn’t have too many places which test your athleticism. There is decent parking at either trailhead. And, most importantly, there are “potties” near both trailheads! You have a choice about the intensity of this hike when you start. If you start at the north trailhead toward Twin Lakes the route presents a few switchbacks with a fairly steep incline. If you start at the south trailhead toward the dam the route achieves the elevation gain along a long gentle incline. Today I’m a wimp so let’s head south or counter-clockwise around the lake. Before we start let us take a moment to drink in the view from the parking lot. This view varies not only from day to day but hour to hour. Some mornings the fog shrouds the opposite shore giving you an eerie feeling as sounds are muted and the air feels heavy. Sometimes the sun shines on rippling water sending out flashes of silver. And some days the lake is so clear you can see the trout undulating in the shadows. What this means is, if you don’t like the view now, come back later as it is guaranteed to change. The trail starts with a “little bit up”, levels out and then gives you a “a lot up” for a good warm-up to get you started on your hike. About the time you “warm-up” you’ll reach the dam. I like the photo ops from the dam area. It is usually a good place to catch the mirror effect from the lake and, depending on the season, there may be a waterfall photo op where the water spills over the dam. When you round the bend to the east side of the lake you’ll pass a small cove with a number of fallen trees. Herons perch on these logs giving you another great photo op. Herons on the island are a little shy so you’ll need to be quiet and careful not to disturb them before you are ready to snap the photo. After a long climb up a gentle incline, you reach the highest elevation gain of this hike. A gigantic moss-covered fallen tree crosses the trail overhead. No worries, it’s been there for ages so it is doubtful that it will chose to fall on you when you are under it. Even so, I don’t dawdle at this point. Just past this tree you’ll find an antique message board in the form of a log with twigs spelling out a message. My informal study finds that about 95% of the “posts” have the word “love” in them. How creative can your “post” be using a few twigs? Give it a whirl before heading down the switchbacks! At the north-end you might find that heron you missed back at the dam. When you round the bend to the westside of the lake you will finally pass all the trees sticking out of the lake and another small cove with logs. 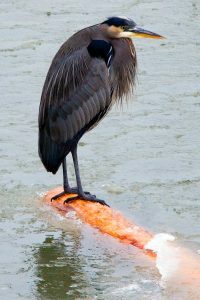 If you don’t find one perched on a log at this point you have most likely passed any heron photo op. So sorry. Come back tomorrow. But do keep your eyes peeled for kingfishers, bald eagles and osprey. They love to fish for trout in the lake. The trail along the westside twists through fir, hemlock and cedar. A tree came down in the winter storm of 2013 taking out a small portion of the trail. Energetic youths from the mainland cleared the tree and rebuilt the trail but it is still a bit rough for a short distance so I suggest you tread carefully. After that it is a fairly easy stroll to the north trailhead and boat launch. There is almost always a photo op at the boat launch. Some misty mornings you can shoot the island as it rises through the mist. Other times the lake is so calm and the reflection of the opposite shore so clear it is difficult to find where the land ends and the lake begins. Friends of Moran is a 501(c)(3) non-profit. Your donation will go directly to Moran State Park to help fund our ongoing park projects such as the Fish Hatchery at Cascade Lake Day Use Area.